Akins & Davenport P.C. is a full service general practice. Our main office is located off of the Historic Square in picturesque downtown Blairsville, Georgia. Akins & Davenport was established in 2006 and has been serving the North Georgia area ever since. 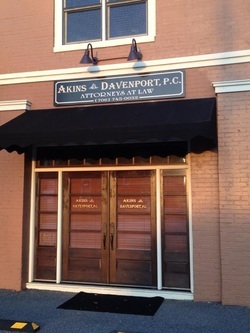 Akins & Davenport is a small town practice dedicated to accommodate to the client and strive to meet every client's legal needs. Feel free to drop by the office or contact the office at (706) 745-0032 if we can assist you in any way.